New kitchen storage and organization accessories. 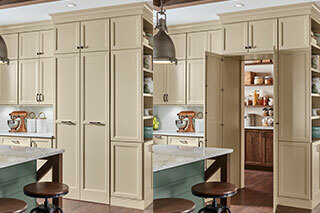 Create a secret walk-in pantry with this design—it mimics the appearance of a classic tall pantry cabinet. 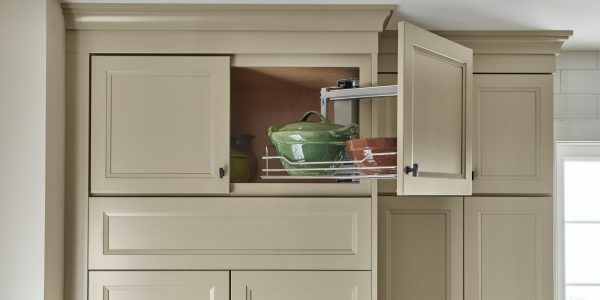 Integrating the closet entrance within cabinetry is both trend-forward and innovative; it streamlines the look of the design and adds a polished, custom feel. Our new wider style mirrors a paneled dishwasher or other standard 24” base cabinet for a more symmetrical design. 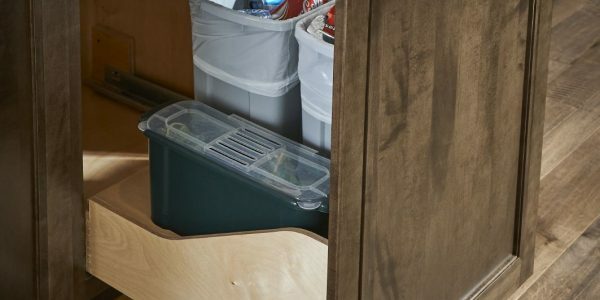 We’re also offering three new configurations with a third container for compost or other storage, as well as a hidden drawer option for trash bags or food wrap. 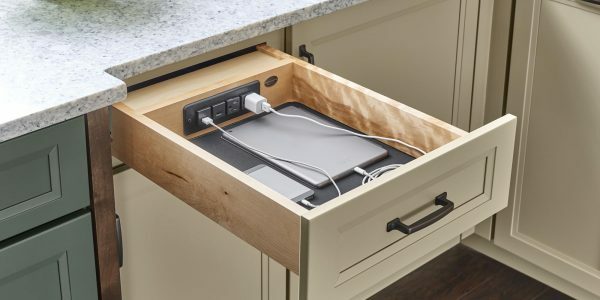 Keep countertops free of clutter by charging electronics inside your kitchen cabinet drawers! This built-in kit includes 2 120V plugs and 2 USB charging ports. 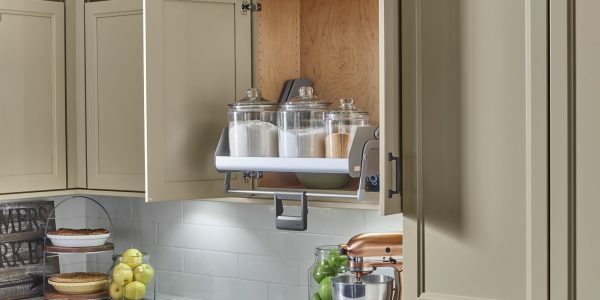 This clever tray swings out of high kitchen cabinets like the ones above refrigerators and other appliances to make the most of every inch of cabinet space. 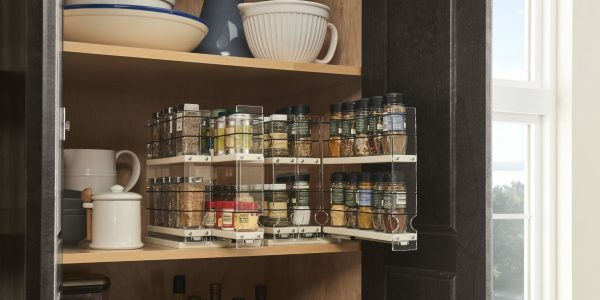 With this wall kitchen cabinet accessory, it’s easy to see and select spices. 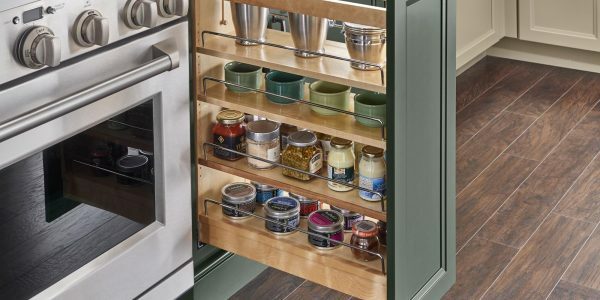 Drawers slide out individually and can hold 50+ spice jars! 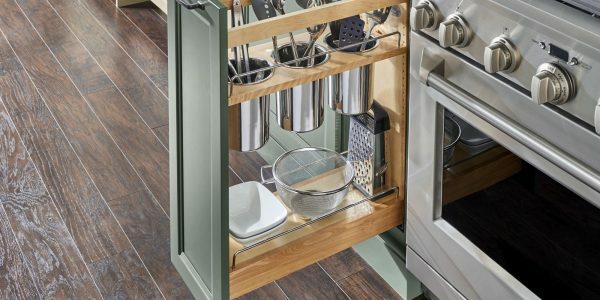 This handy utensil organizer kitchen cabinet features an adjustable top shelf with removable, dishwasher-safe canisters and a bonus shelf for dry goods storage. 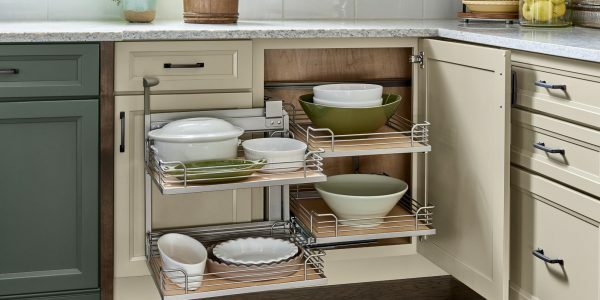 Easily reach top shelves in wall cabinets with a built-in shelf that can be pulled down smoothly to access dry goods, large dishes, and more. Make the most of base kitchen cabinet space with a pull-out–everything is in view and in easy reach.